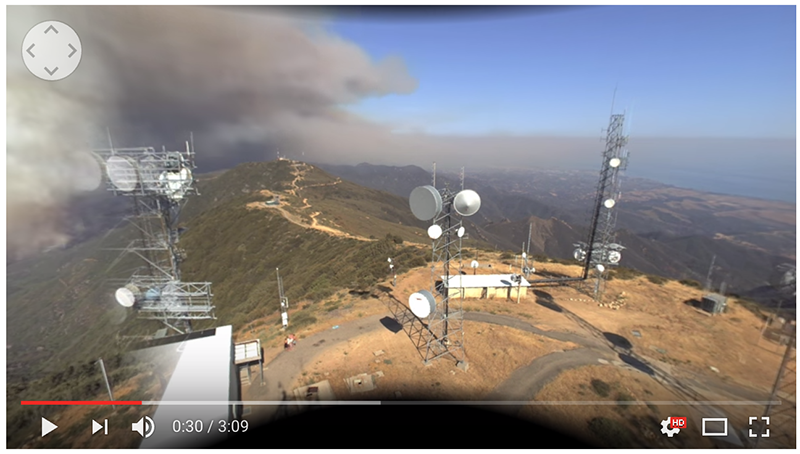 Navigable YouTube video of time lapse sequence. The history of panoramic photography dates back to the very earliest days of photography in 1840s. Techniques to photographically capture panoramas have continued to evolve including the development of bespoke camera systems. With new presentation devices such as cylindrical projection systems and head mounted displays that allow the panorama to convey an immersive sense of a place, there has been considerable effort in developing cameras to record panoramic video. Single camera designs capable of recording 360 video are simple and easily create seamless panoramas but have the disadvantage of not scaling in resolution. Higher resolution requires rigs consisting of multiple individual cameras. 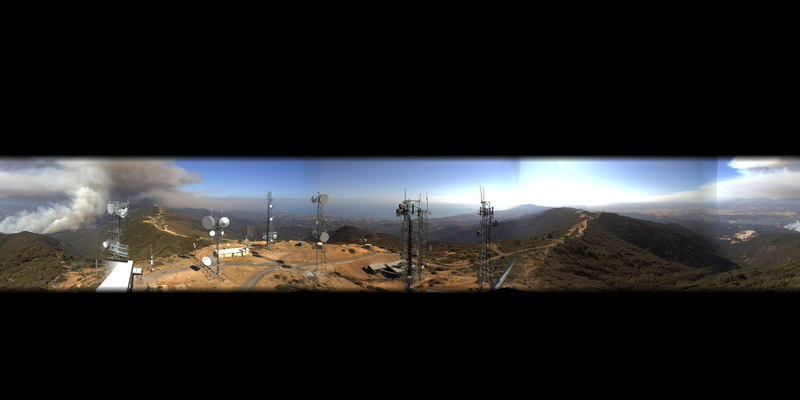 The overlapping images from each camera are fused together to form the final panorama. The challenges for these multiple camera systems involves minimising the inevitable parallax errors  and creating a constant colour grade, the success of these determines how seamless the panorama will appear. 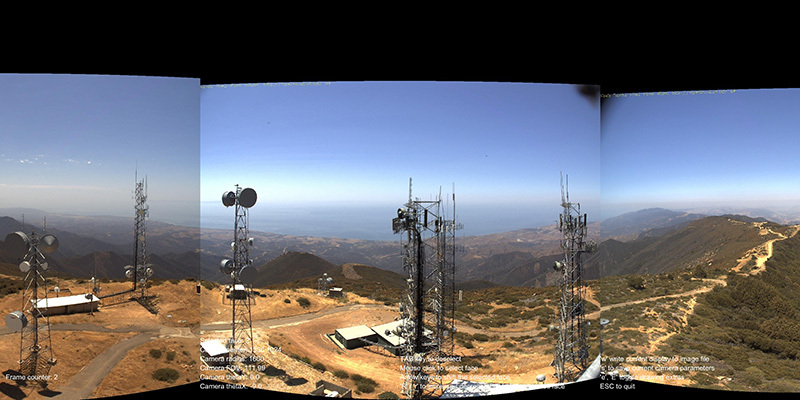 Figure 1 shows a single time snapshot from four cameras mounted on Santa Ynez North Peak on the 8th July 2017. Each camera has field of view (FOV) greater than 90 degrees horizontally and thus captures everything visible (within a limited vertical FOV) from the position of the camera. While these 4 images capture the entire horizontal field of view, as they stand they present a distorted and disconnected view, a form not directly useful for current virtual reality (VR) experiences. A frequently used approach to forming suitable panoramas is to use machine vision to find feature points between the images, that is, points on the same object between adjacent images. Once these points are found the images can be warped and blended together, aligning the feature points, to form the panorama. This approach can lead to spatial distortion but is unsuited in this case because there is not sufficient overlap to find enough reliable feature points, and feature points are rarely found in clear blue sky. The approach used here is to model the key optical and geometric properties of the camera system. This includes the field of view of the fisheye lenses and the camera orientations. Armed with this parameterised model one can project the fisheye images onto the appropriate geometry required for the final panorama. The images would be projected onto a cylinder for a cylindrical panorama, or as in this case, projected onto a sphere to form an equirectangular projection. Figure 2 shows the equirectangular projection corresponding to the 4 images in figure 1. The equirectangular projection is the most commonly used format for VR applications, it extends 360 degrees horizontally and 180 degrees vertically. Each fisheye image is responsible for exactly one quarter of this image horizontally. Since the lenses are slightly greater than 90 degrees the overlap between each quarter is used to blend the images together thus reducing the visibility of the seam. Figure 2: Equirectangular projection, 360 degrees in longitude horizontally, 180 degrees in latitude vertically. The missing part is how to measure the optical and geometric properties of each camera, noting that the author did not have access to the cameras and there is often a 5% variation in commodity optical elements. An interactive application was developed that allows the operator to manually adjust the important parameters and get immediate feedback on the consequences on the alignment of features in the scene. Figure 3 is a screen dump of this application. Figure 4: Center and radius of each fisheye. Using the mouse and keyboard one can adjust the lens FOV, the position of the fisheye on the camera sensor and the orientation of the cameras. For example, each of these cameras is tilted downwards by about 9 degrees. As well as the field of view and camera angles, the software requires the center and radius of each fisheye, see figure 4. Once the desired alignment is achieved the parameters are saved to a file and used in the subsequent processing of frames. Such a parameter file is shown below, the image files can be concatenated together as in figure 1 or separate image files. It should be noted here that due to fundamental parallax issues it is not possible to achieve a perfect alignment across all depths, only at a single depth . The goal here was to achieve a good alignment for distant objects. Additionally, these cameras are not colour calibrated and operating in automatic exposure mode so colour differences between each quarter is to be expected. The advantages of 360 panorama image and video are many. If the panorama is laid out flat as in figure 2 nothing is hidden from view and the local distortion is minimal. One only need to keep in mind that the left and right edge are connected. A navigable perspective view can be presented online  reducing the distortion entirely while allowing the operator to look around in real time. There are a number of surround presentation devices that have been built to give a sense of immersion both without the need to wear anything and providing a more social experience. Examples might be the iDome  or the AVIE cylinders . When viewed within a VR head mounted display one gets an undistorted view while being able to naturally turn around as one might in real life, the ultimate sense of "being there". Timelapse sequence from which figure 2 is a one frame.